That's about as good as you are going to get until, probably, the school holidays. Check out the "Ag" column for the Ridgebacks. As I have said for a few weeks...I have been LUCKY to win. I, more than anyone, have acknowledged my luck. Thats the difference...I can see when I have been lucky. I agree I have been lucky on occasions, however I have had a few games I should have won also. Example, last week when I scored the 2nd highest score with 426 and still lost. Yes, I think its a case of swings and roundabouts...I do recall getting raped in the diner a fair bit last year. This year I have been lucky. By the way, thanks for the table Gerry. Its good to know where we are at. Especially considering how close it is. Only 2 games separates 1st from 8th! Who is going to stop the rampaging Gladiators. In Round 12 he is already on 402 with Cale Morton to play. Probably Bangers who is on 412 for the Round. Yeah, those two are the trendsetters. I can only thank my lucky stars that I am sitting atop the heap with my garbage scores. Really not sure about the points for and against but I think the rest of it is right. 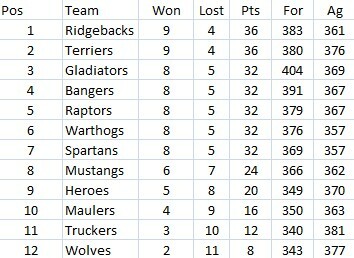 I think you will find the Gladiators 'Average For' puts them ahead of a couple of teams? 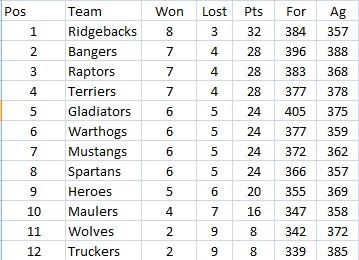 croz wrote: I think you will find the Gladiators 'Average For' puts them ahead of a couple of teams? Boy, did I need that win! The next five weeks are going to be very hard. Yeah my last five are tough. Someone must have an easy run home, cause I know I definitely dont! 4 out of my last 5 games I play someone inside the top 8! I have Raptors, Warthogs, Gladiators, Spartans and, gulp, Bangers. 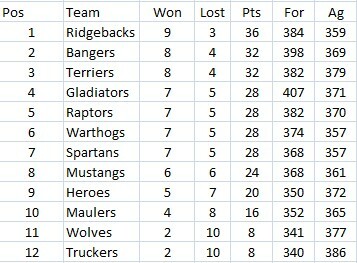 Bangers should be cherry ripe by round 18.
gerry wrote: I have Raptors, Warthogs, Gladiators, Spartans and, gulp, Bangers. Sheeez thats a draw...you will know where you stand thats for sho! Geez and I thought I was hard done by with facing Mustangs, Ridgebacks, Maulers, Terriers, Raptors. Thats a shocking run home Gerry. Who does the scheduling?? Jason wrote: Geez and I thought I was hard done by with facing Mustangs, Ridgebacks, Maulers, Terriers, Raptors. I blame Croz. I just hope to stay in the top four. But as you rightly pointed out Jase, it so close - one loss might be enough to see me tumbling. Just have to win, I guess. Although the strong mail is that Fev wont play this Thursday night, so I might have to chalk the game against Macca as a loss..